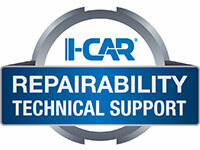 I-CAR and subject matter experts from vehicle makers, collision repairers, insurers, and tool and equipment makers held a meeting in May, to develop, update, and publish an I-CAR best practice on Recycled Outer Quarter Panels w/Rolled Hem Flanges. Outer quarter panels with rolled hem flanges are not candidates for recycled part usage. This is due to the removal process required; alternate removal methods will result in a work-hardened flange that may fail. Outer quarter panels with rolled hem flanges are formed by applying adhesive and folding the edge of the outer quarter panel over itself and the inner quarter panel, “clamping” the inner panel into the fold. These outer quarter panels are attached the same way that a door skin is attached to the door shell; which means that for removal, the edge of the hem flange is ground off. Rolled hem flanges cannot be straightened to release the inner panel, in order to reuse the outer quarter panel. This is due to work hardening of the bend radius, the damage that is caused to the outer quarter panel, and the recommended removal method.